In this page center and radius we are going to see example problems to find the equation of a circle with center and radius is given. To check whether the circle passes through the point (2,0) we have to apply the values x=2 and y=0 in the equation of a circle. So the circle is not passing through the point (2,0). But here we have only center of the circle.We don't have the radius.To find tht let us make diagram ith the given details. 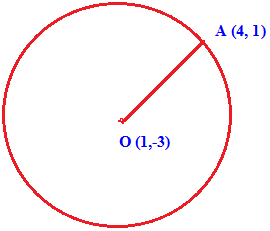 To find the radius of a circle we have to find the distance from O to A.